Bottom and sides are of non-permeable material to prevent leakage or leaching of disinfection solution. Large: 85 x 180 holds 25 litres. All mats are 3cm thick, with a core of bonded urethane foam. To clean, place on edge and hose off. Leave to drain. Disinfection Mats can be used with any disinfectant or sanitizer. 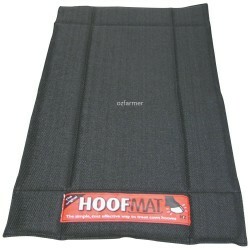 One of the great benefits of changing from a footbath to Hoofmat for lameness treatment and preventi.. The Henke disinfection container is made for easy cleaning and disinfection of Henke extension poles..